This special issue of Petits Propos Culinaires is wholly devoted to a new translation of the text called, for convenience’ sake, A Baghdad Cookery Book, that is, The Book of Dishes (Kitab al-Tabikh) by Muhammad b. al-Hasan b. Muhammad b. al-Karim, the scribe of Baghdad, usually called Al Baghdadi. This thirteenth- century text was for a long while the only medieval Arab manuscript available in English thanks to the translation, in the 1930s, by A.J. 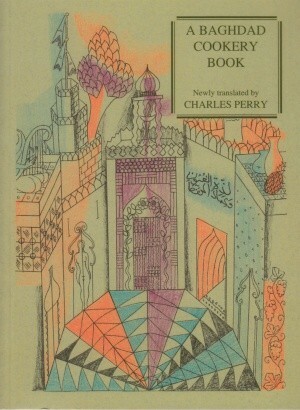 Arberry which was subsequently re-published by Prospect Books in 2001 in Medieval Arab Cookery. In this new translation Charles Perry corrects many errors and misreadings that had crept into early transcriptions. Here we have spread before us, as if on a glorious sideboard, the immense wealth and ingenuity of cooking in the golden age of Arab civilisation. We can detect the influence of Persia, as well as echoes of the Bedouin life, and even the mark of the infidel Christian crusaders. Charles Perry is an independent scholar of food history, especially that of the Middle East and Central Asia. Many of his essays have been reprinted in Medieval Arab Cookery and he has published widely in scholarly journals. By profession a journalist, he worked for Rolling Stone and now writes on food in the Los Angeles Times. The book is also available as ISBN 1903018420 with an extract on this website. Readers may be interested in this detailed critique of our translation of the Baghdad Cookery Book by the food historian Nawal Nasrallah, and Charles Perry, the translator’s response to it.